Together with Alban Perillat-Merceroz, we organized a one-hour presentation of the programming langage Delphi followed by 3 hours of exercises. 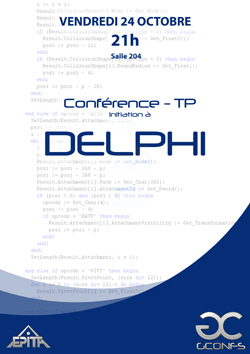 The objective was to introduce Delphi to the students in order for them to be able to start working on their year project. Students had no more than two months experience of programming with Caml, a functional (opposite of imperative) language. The first part of the presentation was a comparison between the two paradigms and how to move from interpreted to compiled code. Then, a brief explanation of the various structures of the languages and how to organize files around the project has been explained. Even if the conference was not mandatory and took place a friday 9pm, there were about 200 students attending. They have been split into two room and attended the presentation made by Alban and myself. Right after, they moved to the computer rooms and started working on the exercises. The exercises focused on very basic things like function definition, for, while and structures for the most advanced. We formed a team of 15 people helping everyone out. Overall, this has been a success. You can download the Presentation Slides (Powerpoint 2007), Exercises subject (PDF) and Correction (ZIP).